IWASSA Co.: Former CEO of Microsoft t prevent his team from the use of Apple products. Former CEO of Microsoft t prevent his team from the use of Apple products. It is known that (Steve Ballmer) is one of the most important personalities digital world, and is normal since he led Microsoft's nearly 14 years since 2000 and participated in the achievement of successes, but since he left his post as chief executive of the company beginning of the current world was believed that he will leave this area permanently, but this belief is incorrect. And it was Steve Ballmer former CEO of Microsoft has left the company beginning of the year, leaving the office of the director of the new year (Satya Ndela) and therefore the Palmer left the world of technology permanently, although it remained the major shareholder of Microsoft's and then moved to a different domain exactly where invested 2 billion dollars in American Basketball Club (Los Angeles Clippers), who practiced in the NBA, but nevertheless it is clear that its relationship with Microsoft never broken. Press sources indicated that the new president of the club (Los Angeles Clippers) Steve Balambrz prevent the members of his team of players and coaches use products Apple Whether it's Juice Pack Air or iPad, where said Steve Ballmer, told Reuters: "the majority of our team are using Windows machines, but there are some players and coaches who do not use it, but that will change with the end of the season. " 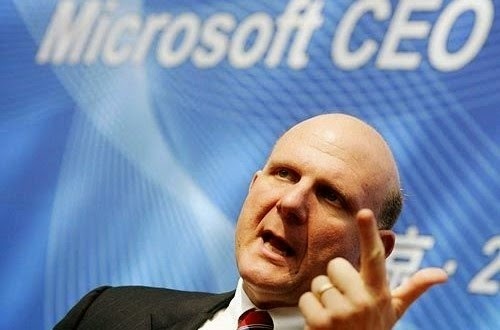 It is reported that Steve Ballmer is one of the hard-liners to Microsoft, where it was pointed out earlier when he was executive director of the company that it prevents his sons and members of his family from the use of any product for Google or Apple in the House, where he confirmed that he has done brainwashed to members of his family in order to keep Microsoft brand The only possible use for them!